Explore the National Mall by the light of the moon with a 3 hour walking tour of the monuments with an expert guide. 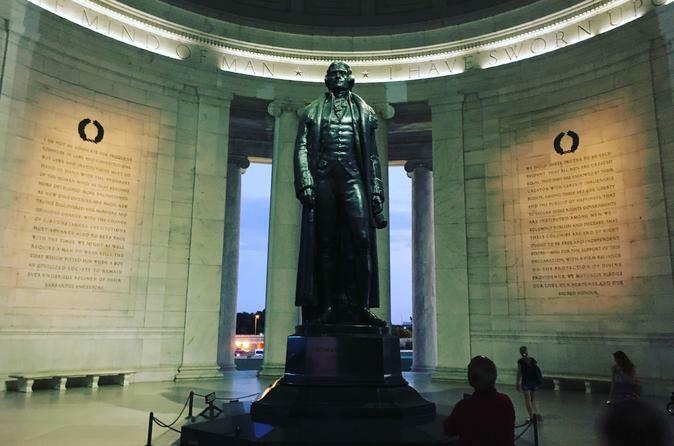 You will visit inside the Jefferson Memorial, Lincoln Memorial, Franklin Delano Roosevelt Memorial, Dr Martin Luther King Jr Memorial and the World War II Memorial. Don’t just walk through the mall, experience it! Put on your walking shoes and follow your local Washington DC guide as you are led through the top sights on the National Mall. Your guide will provide you with history, details and interesting stories along the way. Learn about Lafayette Square, the general it's named after, and the men in the memorials that adorn it. Visit the north face of the White House, as your guide explains the history of the White House and surrounding buildings, where the president lives in the building, and points out the Blair House. Throughout the tour there will be refreshment stands and opportunities for food, drink and restroom breaks. The tour ends at the White House, with easy access to metro, bus or taxi.